If you're into theme parks, Dubai Parks and Resorts needs to be on your bucket list. This is heaven on Earth for kids and adults who are in touch with their inner kid. 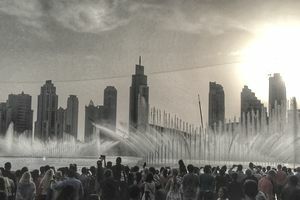 Dubai Parks and Resorts is a multi-stage, mega-development that was built over several years that offers attractions and amusement park diversion in three different theme parks: Motiongate Dubai, Bollywood Parks Dubai, and Legoland Dubai. The development also features Riverland, with places to eat and shop; the Lapita Hotel, which sports a Polynesian theme; and Legoland Water Park. Whether you dig thrills, Lego, Bollywood, the movies, or water fun, this huge park has you covered. The park officially opened in December 2016. Still to come as of 2017: the Six Flags Dubai theme park, scheduled to open in late 2019, and a Lego-themed hotel. It even has its own theme song, "All the Wonders of the Universe," by Alan Menken. The three theme parks were designed by architects Rabben Herman, Gensler, HOK, RTKL, Forrec, and Riva Creative. CH2M Hill and Samsung SDS also provided infrastructure design. Motiongate Dubai is all about the movies, aka motion pictures. Columbia Pictures, DreamWorks, and Lionsgate have their own worlds, with rides and attractions that connect to their famous movies, like "The Hunger Games," "The Smurfs," "Kung Fu Panda," "Shreck," and "Ghostbusters." Check out Studio Central for a glimpse of Hollywood's Golden Age and a behind-the-scenes look at how movies are made. Bollywood has five zones that place you right in environments that are inspired by blockbuster movies from Bollywood. Check out Mumbai Chowk, Rustic Ravine, Bollywood Boulevard, Royal Plaza, and Bollywood Film Studios. Legoland Dubai has, you guessed it, tons of Lego. You can get your kicks on Lego-themed rides and at shows and of course, build with Legos. Tour The Factory, which shows you how Legos are made, check out Kingdoms and Lego City or build and race Lego cars at Imagination. Not to be missed is Miniland, the Dubai skyline built of 20 million Lego bricks. The Legoland Water Park is especially for kids 2 to 12 years old. They can build their own Lego raft to cruise along the lazy river, play in the Joker Soaker, or go on a splash safari. The water park has 20 slides and attractions that are all about Lego plus water. The Lapita is an upscale, up-to-the-minute hotel that's ultra-convenient to all the theme parks in its location on the Persian Gulf. It exudes a Polynesian vibe, from its architecture and decor to its lagoon-style pools and colorful flowers and plants. Riverland is a place to eat and shop, but more than that, it's another adventure. Three of its zones take you back in time in various places in the world. Boardwalk is an urban America street in the 1950s, India Gate is a trip through India, and the French Village evokes a town in France in the Middle Ages. The fourth zone, called The Peninsula, is an outdoor venue for concerts and festivals done up in 19th-century architecture.